Already today, Resysta meets tomorrow´s technical and ecological demands. Owing to the high durability and sustainability Resysta offers, completely new applications are possible. The fibre reinforced hybrid material is produced of approx. 60% rice husks, approx. 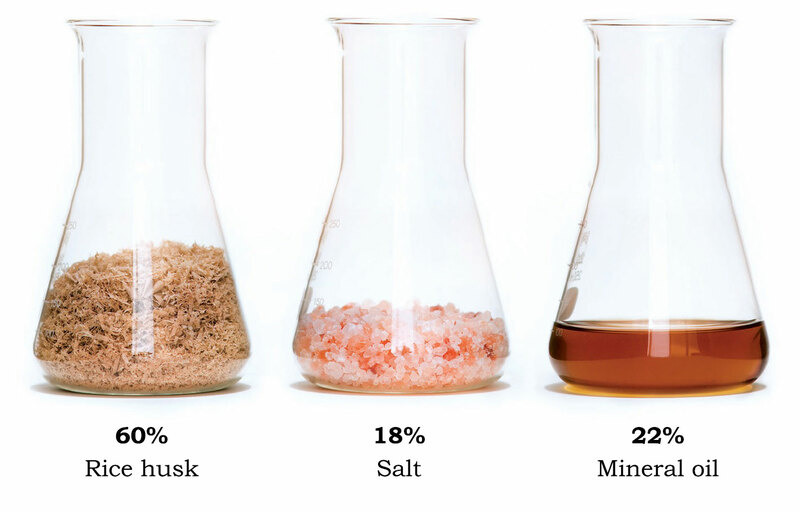 22% common salt and approx. 18% mineral oil, which makes it both environmentally friendly as well as extremely weather resistant against sun, rain, snow or salt water. At the same time, Resysta requires minimal care and offers the look and feel of wood. Water resistant surfaces with the look of wood are Resysta´s future. Wait and see! Water resistant, sustainable and almost identical to tropical wood – all these characteristics open a variety of possibilities in using Resysta. Outdoor furniture, floor coverings and decks of ships are just the beginning. Further examples are house facades, wellness and wet areas. Resysta is not subject to any fluctuations in size caused by humidity and therefore is perfectly suitable for surface treatment. Whatever the future will look like – it is made of Resysta. Resysta is sophisticated as far as its look is concerned, but not very demanding in maintenance. The fibre reinforce hybrid material is absolutely water resistant. Therefore, cracks and splinters are a thing of the past. Also insects and fungi cannot harm Resysta. In terms of maintaining Resysta, the most important thing is: lean back and enjoy! Resysta does not only look like wood – it also feels like it. In order to achieve the typical “tropical wood feeling” a special procedure is applied. To touch Resysta does not only feel good, it also surpasses nature´s model in this respect. Thanks to its special composition, the surface stays free from cracks and splinters in the long term. Injuries caused by wooden splinters are therefore a thing of the past. Even after years, the future material ensures an agreeable feeling. Anyone working with wood will be enthused about Resysta. Like its natural model it can be sawn, drilled, painted, sanded or oiled. However, there is one decisive advantage: Resysta does neither crack nor splinter and its cutting wastes are 100% recyclable. The different profiles of Resysta are produced in an extruderand can be used for many applications. Examples of outstanding designs using the Resysta can be found in the Realizations tab. It was developed by the United States Green Building Council as a certification program for construction companies that wish to build green buildings or retrofit existing buildings to meet better environmental standards. LEED certification is measured in points and it is based on how much a building reduces operating costs and overall impact on the environment. LEED for New Construction and Major Renovations certifications are awarded according to the following scale: Certified: 40–49 points, Silver: 50–59 points, Gold: 60–79 points, Platinum: 80 points and above. RESYSTA can contribute points as follows: Materials & Resources MR Credit 6 “Rapidly Renewable Materials” – Up to 1 point. MR 5 (based on project location and U.S. production location) – Up to 2 points. Indoor Environmental Quality EQ Credit 4.2 “Low-Emitting Materials: Paints & Coatings” – Up to 1 Point. Innovation & Design Process ID Credit 1– “Innovation in Design” – Up to 1 Point.